State Sen. Greg Ball delivered a check this summer. Brewster Little League hopes to upgrade Volunteer Park with recently-secured grant. 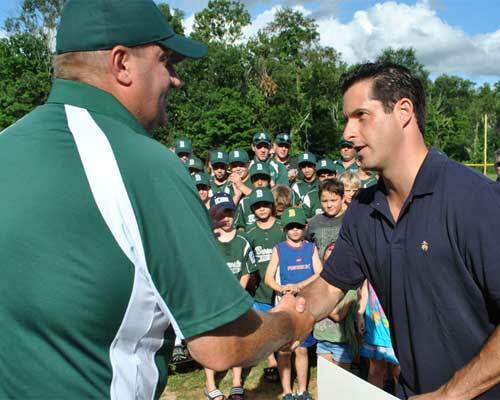 Sen. Greg Ball presented a $95,000 capital grant check this summer to Brewster Little League. He said in a statement that he "made a pledge" to Brewster Little League to obtain money that could go toward rebuilding Volunteer Park ball fields, which sit off Zimmer Road. The money, which will be administered by the Town of Southeast, will be used to make much needed upgrades, including field repairs, electric and water hookups. Brewster Little League President, Carl Peterson, was excited when he heard the money had been secured. "This $95,000 means we will be able to be doing something correct from the get-go, instead of piecing a project together," Peterson said. "This will make these fields a premiere facility in Putnam County ... These fields will be something that the kids will enjoy for the next 20 – 30 years." Putnam County Legislator Roger Gross, Southeast Councilman Edwin Alvarez and Southeast Deputy Supervisor Bob Cullen were in attendance. They thanked Ball for his efforts. "This funding from Senator Ball is greatly appreciated by the Little League and our community," said County Legislator Roger Gross. "This is an opportunity to greatly enhance Volunteer Park for the benefit of all our young athletes. I know the Little League has some excellent ideas for improving this facility." A big thank you to Senator Ball from Brewster Little League!